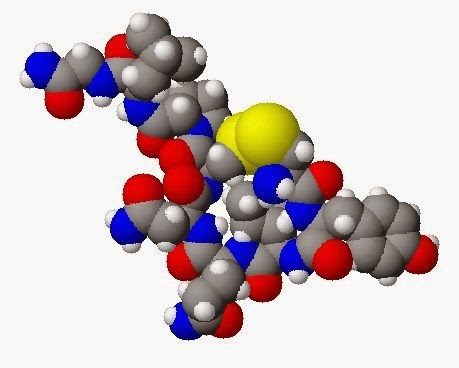 Spacefilling model of oxytocin. Created using ACD/ChemSketch 8.0, ACD/3D Viewer and The GIMP. Image: Wikipedia. "This is the first study to evaluate the impact of oxytocin on brain function in children with autism spectrum disorders," said first author Ilanit Gordon, a Yale Child Study Center postdoctoral fellow, whose colleagues on the study included senior author Kevin Pelphrey, the Harris Professor in the Child Study Center, and director of the Center for Translational Developmental Neuroscience at Yale. "We found that brain centers associated with reward and emotion recognition responded more during social tasks when children received oxytocin instead of the placebo," said Gordon. "Oxytocin temporarily normalized brain regions responsible for the social deficits seen in children with autism." "Our results are particularly important considering the urgent need for treatments to target social dysfunction in autism spectrum disorders," Gordon added.